Fiery Weapon enchant has been mentioned a few times already, but I think it deserves a post of it's own. For a long while now, Fiery Weapon has been one of the best selling enchants. I think it has made me more gold than any other enchant. Not only does it sell fast, but there's also little to no competition so large profits are guaranteed! Although enchanters can make the most gold with this trick, you can also make gold without it! Fiery Weapon needs only several reagents and they are all almost free usually. I've snatched many Essences of Fire for a few silver coins and Small Radiant shards for 1-4g usually, unless I've relisted some for 60g each instead. If there are no materials for sale, these are quite easy to farm. Here's my favourites! You can make Aquamarine Signets that disenchant into Small Radiant Shards every time. The best source of Small Radiant Shards is in my opinion, Scholomance. As for essences, Molten Core is an excellent source for Essences of Fire. Other places have too low drop rates for them to be worth farming. Usually Fiery Weapon scrolls sell for 60-100g easily and within 48 hours. But I don't know how to make Fiery Weapon enchants! 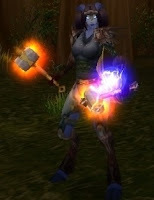 Formula: Enchant Weapon - Fiery Weapon is a drop from Blackrock Depths, but it can also be found in the Auction House. It's price is often between 30 and 500g, so it might be worth it to farm a bit yourself and sell the excess recipes. I have to completely agree with you! Not necessarily my most profitable enchant, but certainly quickest seller, I usually sell one or two every day for 100-150g.